Bob's third CASE book - Online Innovations in Annual and Regular Giving: Ten Dozen Departures That Worked - features a whole mega-bunch of creative Web-based fundraising strategies from e-mail and video to crowd-funding and micro-philanthropy. The new book includes a pdf version with live links to sites, videos and more. Annual giving remains a foundation of the development program, but best practices are changing fast. Read Bob's quotes in CASE Currents about evolving strategies for annual giving. See all of Bob's quotes in print. Bob's second CASE book - More Innovations in Annual Giving: Ten Global Departures That Worked - features creative annual giving strategies from institutions around the world, including Australia, India, Singapore, Hong Kong, France, the U.K. and beyond. Included are examples of data mining, leadership giving, reunions parent funds, faculty and staff appeals, the Internet, direct mail and more. Read more about the book and order from the CASE Books website. Here is Bob's article from the August, 2007 issue of Fundraising and Philanthropy Magazine in Australia. Review and download pdf past issues of Bob's monthly "Latest Departures" annual giving newsletter. Click here to review past issues. Review and receive Bob's published articles on a variety of annual giving topics. Click here to review and download articles. Discuss the latest new overseas annual giving fundraising ideas in social media, email, micro-philanthropy, crowdsourcing, video and others. Discover smart overseas enhancements for traditional annual giving methods-strategies for phonathons, direct mail and personal solicitation. Determine the role and use of volunteers in far-away places for annual giving. Review considerations for presenting the annual giving case for support in a multilingual and multicultural world. See more at the CASE Web site. Online Annual Giving Success: On November 18, 2004, Bob hosted a CASE Online Speaker Series program that featured examples of online annual giving fundraising. Joining Bob were Lorna Lodholz, director of annual giving at North Carolina State University, Shawn Dailey, associate director of annual giving at Kenyon College, and Barbara Daines, associate director of alumni relations for the Stanford Business School Alumni Association. More than 200 schools, colleges and universities participated in the seminar - one of the largest CASE web seminars in their history. The audio and handouts from the seminar are available from CASE at their web site here. 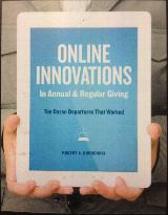 Innovations in Annual Giving: On April 14, 2004 Bob hosted a CASE Online Seminar that featured excerpts from the book Innovations in Annual Giving. His featured guests were Laurent DeJanvry from the University of California at Berkeley, and Mari Aylin from St. Olaf College, who both discussed alumni surveys they've used to understand annual giving behavior at their schools. More than 100 schools, colleges and universities participated in the seminar. The audio and handouts from the seminar are available from CASE at their web site here. WASHINGTON, D.C. -- Annual giving is the foundation of most successful fund-raising programs, yet many institutions don�t have a strategy in place for turning �interested bystanders� into �impassioned philanthropists� and instead rely on anecdote rather than data to make important decisions. 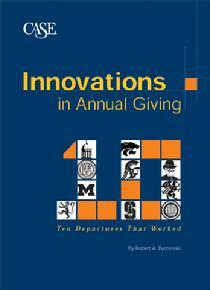 A new book published by the Council for Advancement and Support of Education, Innovations in Annual Giving: Ten Departures that Worked, profiles 10 annual giving programs that consistently gain first-time donors, cultivate loyalty, and persuade existing donors to increase their gifts over time. Annual giving programs are institutions� yearly solicitations of alumni and other friends and supporters. Aside from the total dollars raised during these appeals, the percent of alumni who donate is widely considered to be one measure of alumni loyalty. "Innovations in Annual Giving will provide those managing mature annual funds in the UK with a host of ideas and a broad focus to consider how they may wish to take their programmes forward." "The book was a quick read with lots of ideas to get us brainstorming. It made us realize that good programs do not happen overnight and that a long-range plan is needed, especially in bringing along our alumni giving participation." "...Bob Burdenski 'gets it'...his whip-smart book is framed by this sensibility and the great ideas inside will take you 'inside the looking glass' to applications in your own program." "A great mix of proven best practices and new, creative approaches to annual giving. Some excellent examples of new initiatives that have had a measurable impact on fund-raising results." "Besides the furor of new ideas it has generated, the book itself has become invaluable when approaching the many different academic units that we support and offering alternative options to the standard approaches." �An institution inspires feelings of affinity in its donors, teaches a philanthropic culture, and instills a progressively loyal and generous giving habit,� Burdenski writes. Burdenski focuses on annual giving programs at the Universities of Iowa, Rochester, Michigan, California at Berkeley, and Southern California; Kansas State, Stanford, and Carnegie Mellon Universities; Reed College; and Phillips Exeter Academy. The programs were chosen because they all have been successful and have characteristics that can be modeled by other institutions. Kansas State University�s program, even in this high-tech age, continues to rely on a yearly phonathon manned by hundreds of student volunteers. The program is legendary for the loyalty it has inspired: Most recently, the phonathon raised nearly $2 million from more than 20,000 alumni donors. �For institutions that face limitations on automation and other resources, or are simply looking for a good profitable time, the K-State program is a role model,� Burdenski writes. The University of Rochester, on the other hand, is an example of how annual giving programs can be integrated with the Internet, moving beyond simply providing a giving page on the university�s Web site to full-scale solicitation of many alumni via e-mail. �The Rochester Fund now sends e-mail messages that provide donors with periodic updates on how their gifts are being used. The kind of stewardship that used to be cost-prohibitive is now easily and inexpensively available via e-mail,� Burdenski writes.